Currently looking for member to take on this position in an interim - acting capacity. According to our rules, the position of Vice Commodore is open to nominations from the floor membership upon a vote. The continuing vacancy of this position is a serious issue for the management of the club moving forward. The current watch is actively looking for candidates with the skills and drive to learn, assist, and eventually manage the club into the next watch. If you are inclined and are passionate about having an organized sailing program in Venice, please contact the board with your inquiries or if you wish to nominate someone for consideration. The office of VSS Vice Commodore is currently not filled. If you have what it takes to help run a sailing club or know someone who does, please contact the other officers. The day sail on April 22nd was a huge SUCCESS! We had 5 participating boats and approximately 20 people out on the water. We couldn't have asked for better weather. Many thanks to the boat owners for allowing the use of their boats and the many members that participated as crew. We topped the afternoon off at Marker 4 with food and drinks. We've posted some pics on the VSS website, so please check them out. Hopefully, there will be many more day sails in the VSS future. Greetings from the VSS Vice Commodore's Corner. I hope everyone had a very happy, safe, and satisfying holiday season! A big " Thank You " to all who braved the Icy wind and waves. You made this year's Steak & Sail fun and memorable, even if no-one could sail there. If anyone has pictures of the event that they'd like to share with the squadron, we'd love to display them on the web site. This was a wonderful way to get to know new members, as well as to visit with existing members. I hope we have many more fun filled events together. A special Thanks to Keith Embree who took the time to motor down to the area and report depths of Stump Pass and the channel from the ICW to Rum Bay. Even though we couldn't sail down, the information was critical. Thanks again Keith! I wanted to take this opportunity to mention the tremendous support we received this year for the Bridge Tender Cookie drive. Thank you again to the many ladies who baked cookies and helped to create some of the best cookie plates ever. The variety and quality of this year's cookies was outstanding, and I'm sure VSS is held in high esteem with the bridge tenders because of your skill and effort. Thank you all. 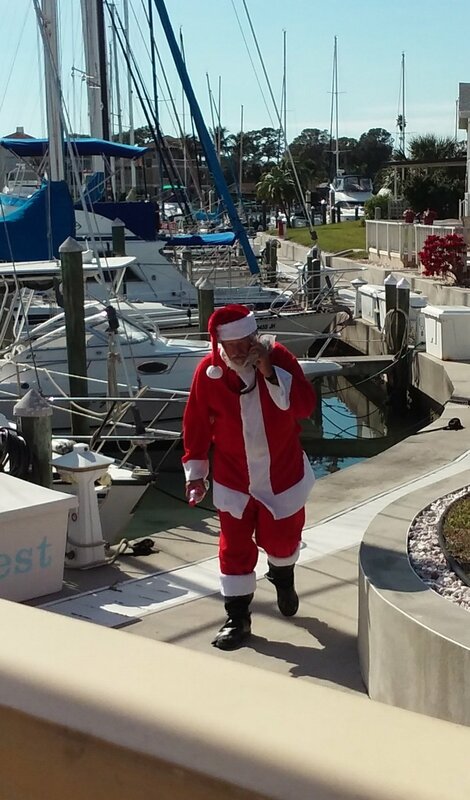 We also had tremendous support from Santa, John Lynch, who once again charmed southwestern Florida with his merry " Ho, Ho, Ho ". I especially appreciate his efforts in this event as John has been trying to retire from the Santa scene. I hope he has just one more year in him! Thanks, John. The cookie drive would never be the same without you. The cookie elves showed up in great numbers this year as well, and though we didn't have quite enough elves to make 2 groups this year, our single group was large enough to really draw some attention. The bridge tenders were very thankful as they are every year, and they appreciate being recognized in a job where they're mostly ignored. Thank you, elves. You did a great job! A fun and filling Steak & Sail Oct 2017. For those adventurous sailors thinking of sailing down to the Rum Bay Restaurant for the Steak & Sail, I have some important information. This will be an exciting opportunity to get together at a location that can be reached by land or sea. The scenery will be beautiful and the food will be fantastic. Please join us at this wonderful getaway to kick off the sailing season.